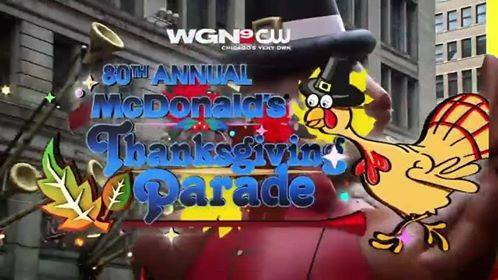 Home Tags Posts tagged with "ronald mcdonald"
The 80th Annual McDonald’s Thanksgiving Parade kicks off the season with a fun-filled morning in the heart of Chicago downtown. From 8 am – 11 am on November 28, watch the colorful procession makes its way up State Street from Congress Parkway to Randolph Street at this free, all-ages event. Only at the McDonald’s Thanksgiving Parade in Chicago you can catch a 50-foot helium turkey balloon float down iconic State Street and Ronald McDonald working the crowd. Originally called the Christmas Caravan in the 1930s, the parade was created to help lift the spirits of residents suffering though the Great Depression. What started out as an attempt to boost Chicago’s economy has evolved into a full-scale holiday spectacle and cherished tradition for Chicagoans and Americans alike. Join the crowd of 400,000 spectators as they line up in the Loop along State Street. At the front, Mr. Ronald McDonald is your honorary grand marshal and he leads a parade of over 100 units, a lively mix of everything from equestrian performers and fire twirlers to ballerinas and soul steppers. Gaze upward as the skyline fills up with giant inflatable helium balloons. You’ll see a cast of familiar faces from Garfield the Cat outfitted as a pilgrim to Bullwinkle J. Moose looking sharp in his suit. Wave at the entertainers atop decorative floats. Don’t miss fan favorite Santa Claus as he ushers in the holidays with his trademark red suit, white beard and jolly smile. On the ground, talented equestrian groups, high school marching bands and specialty units keep the crowd entertained for hours. Catch miniature horses, cowgirls and beautiful Arabians. Marvel at the Samoan Fire Dancers and Jesse White Tumblers. Move to the music with Bolivian dancers, Irish steppers, Taiwanese puppets – even a dancing Chinese dragon. Topping it all off are incredible staged performances throughout the day within the main stage area between Washington and Randolph Street. Join Teddy the Turkey, the parade’s official mascot, for Chicago’s annual holiday tradition. For additional details on the 80th McDonald’s Thanksgiving Parade, including the full lineup of performer groups and information on VIP Experience tickets, visit chicagofestivals.org.